Magnetic Photo Booth Picture Frames are made specifically for the photo booth strip pictures used so often at weddings. Made with either white or black flexible sheet magnet and photo friendly crystal clear vinyl to protect and display your photos on any steel surface. Sealed along the long sides and open on both ends, photos just slide in and stay in. The frames mail easily with a card or letter. We're always stocked and ready to ship. Theses sleeve style frames are made from flexible magnetic vinyl, not Acrylic or Plexiglas. 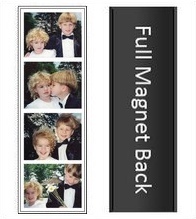 Photo Booth Strip Bookmarks are an economical way to preserve memories of your special event. The bookmarks are made of crystal clear photo friendly vinyl to protect your photos in a usable bookmark.